The ritual viewing of department store windows is part of the official “Christmas in New York” experience, right along with visiting the gargantuan Christmas tree at Rockefeller Center and body-checking your fellow holiday shoppers at the Manhattan Mall. Saks Fifth Avenue and Macy’s are among the stores most noted for their holiday window displays. 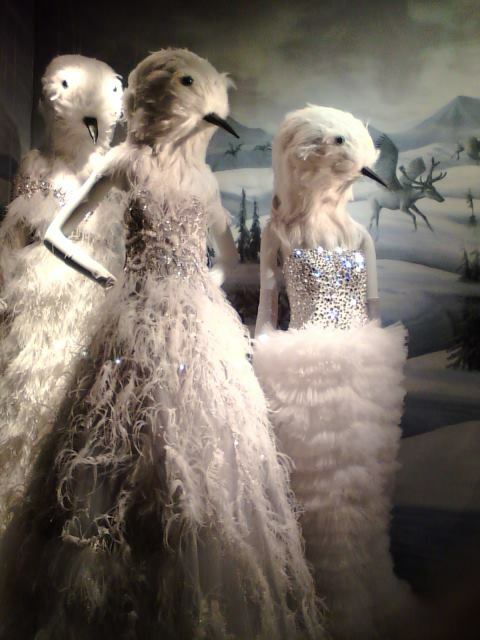 Personally, though, my vote for Best in Show this year goes to Bergdorf Goodman, which has elevated the window display from whimsical entertainment to enchanting art installation. The theme this year is “Carnival of the Animals,” and each window presents a fantastical animal tableau that incorporates antiques, couture fashion, and numerous touches of artistic inspiration. 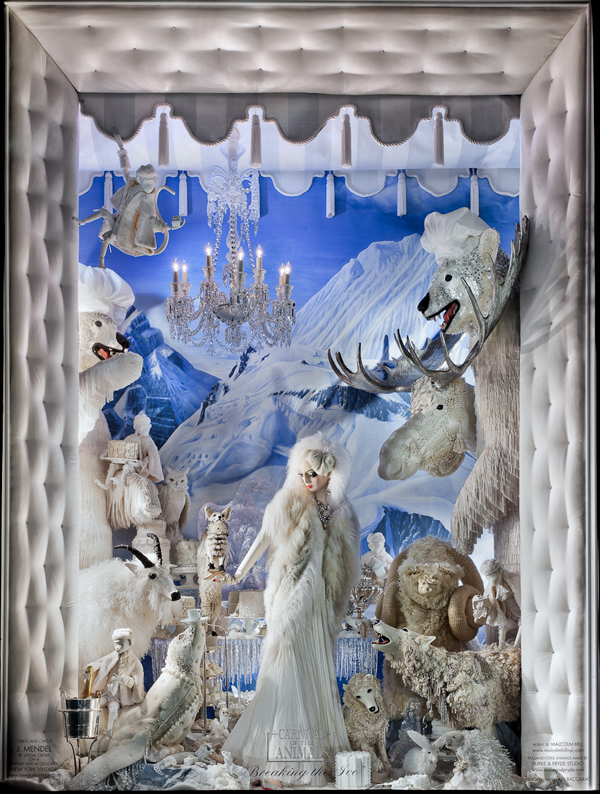 Unlike most displays this time of year, Bergdorf’s isn’t overtly Christmas-y, though one window does depict an arctic garden party and others are in wintry whites and blues. Without question, the display is ideal for viewing on a cold December night after Fifth Avenue has grown quiet and still. Going in the later hours when the tourist traffic has cleared out gives you time to really examine each window. Senior Director of Visual Presentation David Hoey and his team, who will begin work on next year’s display as soon as this display ends on January 3, have created incredibly detailed pieces that merit close examination. The creatures are full of mischief and personality, and a long look gives you a chance to appreciate the ram’s peculiar expression in “Breaking the Ice” or the textures in the 3D paper piece “Teacher’s Pets”. In “Artists and Models,” set in a warm-hued sculptor’s studio that looks like it would be a cozy place to escape on a frosty winter’s night, I even noticed a wooden man that is identical to an antique in my grandmother’s house. The fun goes beyond the five main display windows along Fifth Avenue. Be sure to walk around the corner onto 58th street to see some delightfully bizarre windows featuring mannequins with animal heads in formal evening attire, posing for pictures. Here’s to Bergdorf Goodman for bringing a little artful weirdness to the holiday season!